Paraguay's mining industry employs approximately 31% of the labor force and the mining industry accounts for approximately 25% of Paraguay's gross domestic product. Paraguay is a landlocked country in central South America. Due to its central location in South America, it is sometimes referred to as Corazón de Sudamérica (“Heart of South America”). Popular Paraguayan dances include the bottle dance and the polka. 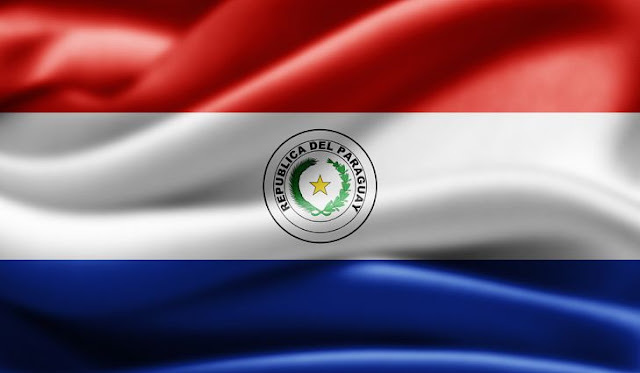 The official name of Paraguay is the Republic of Paraguay. Football (soccer) is the most popular sport in Paraguay. Paraguay is bordered by Argentina to the south and southwest, Brazil to the east and northeast, and Bolivia to the northwest. Fishing is a popular past time in Paraguay despite the fact that the country is landlocked. The Paraguay River (also known as the Rio Paraguay) runs through the country. Paraguay has two official languages, Spanish and Guaraní. Paraguay's climate ranges from temperate to subtropical, and only wet and dry periods depending on the season. As of 1 January 2016, the population of Paraguay was estimated to be 6,683,941 people. Paraguay's military includes an army, navy and air force. Paraguay has a total area of 406,750 square kilometers (157,047 square miles). Paraguay is the world's fourth largest soybean grower. Asunción is the capital and largest city of Paraguay. It is the home of the national government, principal port, and the chief industrial and cultural centre of the country. Paraguay is the world's second largest stevia producer. Paraguay's citizens love music. Traditional music includes a 38-string harp. Paraguay is the world's tenth largest wheat exporter. Paraguay is home to large swaths of swampland, subtropical forest and chaco, wildernesses comprising savanna and scrubland. Cerro Peró or Cerro Tres Kandú is a peak and the highest point of Paraguay, with an elevation of 842 meters (2,762 feet). The largest working hydroelectric power plant is located on the Parana River, shared with Brazil and Paraguay. Its name is the Itaipu Dam. Paraguay has 42 protected wildlife areas and 10 national parks. Cerro Cora National Park is the largest protected area in Paraguay with 5,538 hectares. Established on February 11, 1976, it is a nature reserve, as well as a major historical site. Paraguayans also enjoy a Guarani dish made of beans and maize called jopara. Anywhere else in the world Saltos del Monday would be a major tourist attraction. These 45 meters (148 feet) tall and approximately 120 meters (394 feet) wide falls are truly breathtaking. Nevertheless this beautiful waterfall suffers from its close proximity to Iguazú Falls on the other side of the border. Approximately 89% of Paraguay's citizens are Roman Catholic although Christianity, Protestantism and Judaism are also observed. Paraguay has 1 UNESCO world heritage site. The Jesuit Missions of La Santísima Trinidad de Paraná and Jesús de Tavarangue are located in the Itapúa Department, Paraguay, and are religious mission that are still preserved and that were founded by the Jesuit missioners during the colonization of South America in the 17th century. These religious missions were created in 1609 and developed for 150 years. Both Jesuit missions were declared World Heritage Site by the UNESCO in 1993. Paraguay's national dish is sopa paraguaya. This dish is cornbread made with onions and cheese. Paraguay got independence from Spain on May 14, 1811. This day is celebrated with a lot of festivities every year. The top exports of Paraguay are hydroelectric power and soybeans. Other major exports include edible oil, meat, cotton, wood, and leather. The official currency of Paraguay is Guarani, with the code PYG. The Itaipu Dam built across the Parana River is the 2nd largest hydroelectric power plant on the planet. Since 2012 the Three Gorges Dam in China is the largest. The Itaipu Dam is situated on the border with Brazil; the dam is owned by both countries. The Guarani language incorporates the sounds of nature into many of its words. These words imitate the natural sounds of waterfalls, forests and even animals. This type of language is called an onomatopoeic language. The Paraguay River, which divides the country into two halves, is South America’s second-longest river after the more famous Amazon River. Only about 2% of the entire population of Paraguay lives to the west of the Paraguay River. About 95% of Paraguay’s people are mestizo (mixed Spanish and Guaraní Native American descent). Tereré or Tererê (of Guaraní origin) is an infusion of yerba mate (botanical name Ilex paraguariensis), similar to mate but prepared with cold water and ice rather than with hot, and in a slightly larger vessel. It is Paraguay’s national drink. Paraguay covers an area of 157,048 square miles. Sopa paraguaya is a traditional Paraguayan dish. Literally meaning “Paraguayan soup,” sopa paraguaya isn’t quite what its name would suggest. Rather, it’s corn bread flavored with cheese and onion, among other ingredients. Paraguay's most populated cities include Asuncion, San Lorenzo, Luque, Capiata, Lambare, and Fernando De La Mora. One of Paraguay’s iconic crafts is nanduti, the embroidered lace that probably arrived from the Spanish island of Tenerife. The word itself, meaning “spiderweb” in the Guarani language, aptly describes the weavers’ geometric patterns but not the rainbow of colors that embellish their designs. Paraguay's capital city is Asuncion. This is Paraguay's cultural center and is also one of South America's oldest cities. Most homes in Paraguay have no doorbells. Instead, you are expected to announce your arrival by clapping your hands. The first railway line in Paraguay (and in South America) was constructed between 1858 and 1861 by British engineers. Guaraní is an onomatopoeic language. Many of its words, like its music, imitate the natural sounds of animals and the natural environment. Paraguay’s flag is the only national flag in the world to have different emblems on the obverse (front) and reverse (back). The front of the Paraguay flag has the country’s state coat of arms on it, and the back has the country’s Treasury Seal. The name Paraguay originated from a Guarani word but the exact meaning is not known. Some believe that it means 'river which originates a sea', or river that flows through the sea', or 'river crowned'. Another interpretation is that Paraguay was named for a great Indian chief named 'Paraguaio'. Paraguay has serious issues with clean drinking water. It is estimated that less than 3% of the population has access to clean drinking water. There is no consensus for the derivation or meaning of the name Paraguay, although many versions are very similar. The most common interpretations include: “Born from water”, “river crowned”, “Riverine of many varieties”, “river of the habitants of the sea” and “river that flows through the sea”. The distribution of wealth is markedly unequal in Paraguay with 80% of land held by 2.5% of the population and 161 people controlling 90% of the country’s wealth. donors. No evidence exists that this is indeed true, and the notion has been outright denied by members Paraguayan government.